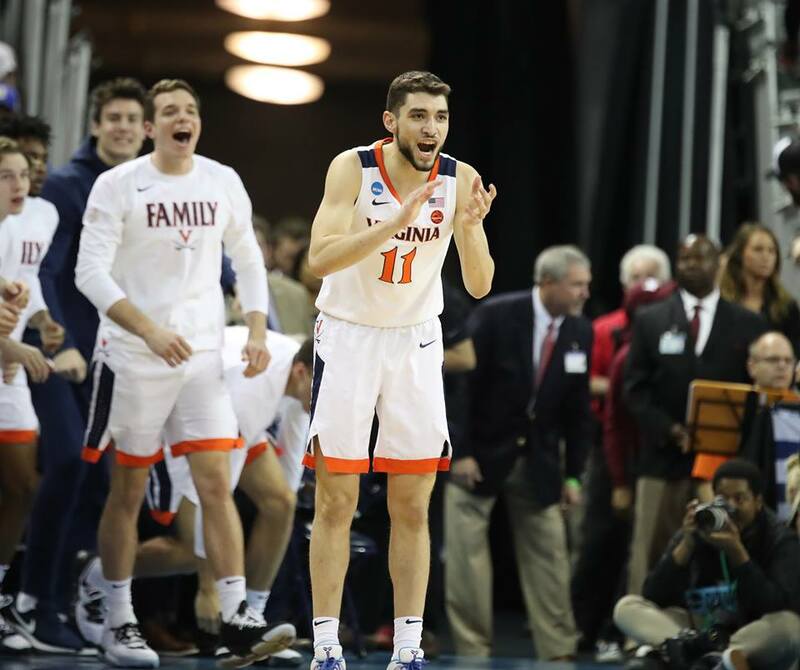 MINNEAPOLIS – With the Final Four set to tip off in about an hour for Virginia, there’s time for one last look at Auburn and what a few keys might be in the contest. The two teams are scheduled to begin their game at 6:09 ET. As observers have pointed out many teams in the days leading up to this matchup, it’s a contrast in styles with the Tigers wanting to create turnovers and run to shots while the Cavaliers want to contain opponents to force tough shots and then make them defend throughout possessions on the other end. Beyond that, however, there’s a handful of things that I’m interested in watching. 1. Shot selection. Auburn leads the nation in turnovers created per possession at 24.3% for its opponents so naturally that’s grabbed a lot of headlines this week. Unless the Cavaliers have an outing like the NC State game in Raleigh, they’re probably not going to turn it over at quite that high of a rate. If they’re in the neighborhood of their 9 turnovers per game average – so 8, 9, 10, 11 turnovers – that’s probably in the range needed to keep the Tigers from turning it into too many chances offensively. The interesting piece for Virginia that’s also related to transition defense, though, is shot selection. If the Hoos are taking long jumpers, particularly long contested jumpers, that can lead to long rebounds that behave exactly like turnovers by getting Auburn out and running from above the free throw line. That may not lead to official fastbreak points, but it can lead to unsettled defense and matchups that the Tigers could exploit. Teams don’t manage to get UVA into bad shot selection mode very often, but if Auburn can successfully do that, it could be just as important as turnovers. 2. Extra pass. One of my favorite plays in basketball anyway is the extra pass where a player gives up a chance at a semi-contested shot for one more pass to an open shot for a teammate. My hunch is that subtle little thing is going to be a key in this one. For example, Auburn likes to run on offense and then spot up behind the 3-point line – that’s something we know, but the Tigers whipped Kansas by not just getting it up the floor fast but by making one more pass even when Kansas’ initial transition defense was there. That led to some wide open corner 3’s and eventually a romp. On the other side of things, Auburn plays a high pressure man to man defense that tries to create turnovers but that same style also sells out on running at players and getting them off the 3-point line to dribble into the teeth of an active defense. That type of defense can also lead to scramble situations where an offense can drive and kick, force one more closeout, and then snap the ball over one more time to an open shooter. If UVA is as patient as it often is in those scenarios, that’s the exact kind of play that could pay dividends. 3. 3-point shooting numbers. Virginia enters the game ranked 8th nationally at 39.4% shooting on 3’s, while Auburn is 15th at 38.3%. So both teams can shoot it. With this game taking place in a football building at the Minnesota Vikings’ U.S. Bank Stadium, however, there have been a lot of questions for players and coaches this week about shooting in that atmosphere and sight lines for shooters. Rather than assume, I got the chance to walk out on the floor and see for myself. Even though I couldn’t actually shoot out there, I was surprised that it didn’t feel as big or the stands as distant as I expected from the chatter about it. On shots from the wings and near the top of the key, there’s a lot of space behind the baskets, but the background didn’t feel like a tunnel or hangar for me. In the corners, the ribbon advertising boards were in the sight lines so maybe that’s an issue but those too are far enough away that it might not matter. 4. Deflections and tips. It seems simple, but both of these teams have defenses that like to get their hands around the ball to create issues for the opponent. For the Hoos, that comes in the form of hedges against ball screens where the extra defender pokes the ball away or on rebounding action where the ball gets tapped backward. For the Tigers, that comes from players digging in against drives and mirroring hands on pass attempts. Those little tips and deflections play a big role in rhythm even if they don’t show up statistically. It’ll be something to watch.